I am pretty lucky because I get to do all kinds of things. 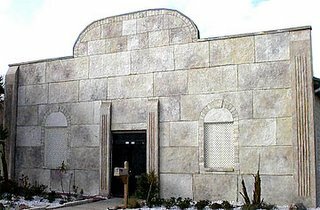 I recently painted the front of a Jewish synagogue to look like Jerusalem Stone. 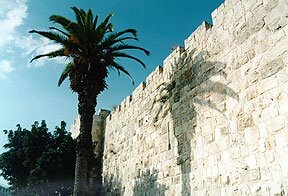 As explained to me Jerusalem Stone is the name of the stone used to build the ancient city of Jerusalem and you can still it everywhere in the city today. 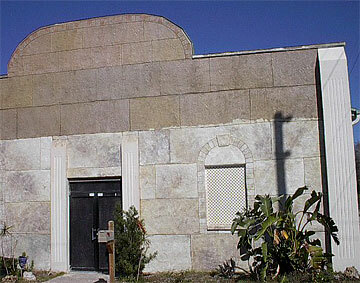 Here is a current picture of a building in Jerusalem with Jerusalem Stone. 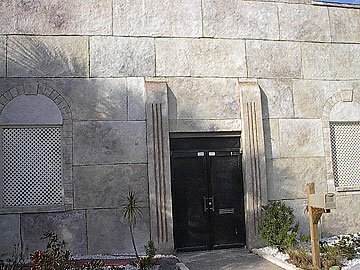 The front of the building I worked on had already been made to look like large stones. But the color of them was not at all the color required to look like the Jerusalem Stone. Here's a picture of the front after I had faux painted half of the wall. You can see how dark they were before I got there. I had to use an extension ladder to reach the top as it was 24 feet high at the highest point. The columns on either side of the door and at the ends of the building were also painted to look like stone. The color was perfect for what they wanted. A few close-ups below. 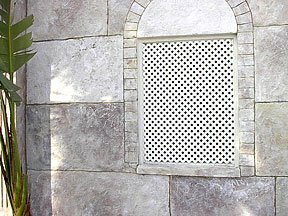 To paint this effect I first used a white primer on each block. Then I 'dry brushed' three different colors over that and on top of each other.